This article was first published in New Labor Forum. Most Americans believe in the idea of democracy, however frustrated they may be by the gap between the promise and reality. Some would argue that the current US regime is closer to an oligarchy or plutocracy than a democracy, but all save for a small fringe would agree that the United States should be a democracy — that “the people” should rule. Likewise, most Americans have a strong sense of having certain democratic rights — freedom of speech, freedom of assembly, due process under the law, and freedom from unlawful search and seizure. While the ability to exercise these rights remains far too dependent on skin color, zip code, and bank account, the widespread sense of moral outrage when these rights are violated shows the extent to which people believe in them. However, a vast majority of Americans live a paradox: they check their deeply held democratic rights at the door every day when they show up for work. That is because the rules and rights associated with democracy only apply to people’s relationship to their government, not their employer. Citizens in a democracy remain subjects in the workplace — the place where most adults spend a large part of their waking hours. Employers can limit what people can and cannot say at work, or where and when they assemble. They can intrude into people’s private lives, monitoring their private correspondence and keeping tabs on their non-work activities, or limit their breaks, including where and when they can use the bathroom. With few exceptions, employers are under no compulsion to guarantee due process to those they employ. They can largely hire, fire, and discipline workers at will. To the extent that employers treat their workers well, it is entirely at their discretion, as revocable and subject to change without notice as a king’s writ. Even for the 10 percent of US workers who have a union, their scope of activity is usually restricted by a more or less expansive “management’s rights clause.” Today’s unions may guarantee certain basic civil liberties in the workplace, but do little to challenge management’s sovereignty in the workplace. This sharp divide may not seem out of the ordinary today, but this was not always the case. Understanding how and why those links frayed, then dissolved, can help explain the paradox of workplace democracy that most workers experience today — and suggest possibilities for resolving that paradox. As mass industrialization escalated, the Civil War-era idea of “free labor” as a requirement for democratic citizenship took on new meanings. Whereas President Lincoln and his contemporaries saw “free labor” for wages as a way station to self-reliance as a small employer, for postbellum workers, reliance on wage labor for survival would be more permanent. This did not mean, however, that they accepted the premise of wage labor. Rather, groups like the Knights of Labor called for the abolition of the wage system, recognizing, as organizer George E. McNeill declared in 1877, “an inevitable and irresistible conflict between the wage-system of labor and the republican system of government.” They saw a close link between economic and political democracy, and argued that they could not be full citizens in a republic if they were wage slaves at work. Many of these efforts came up short, as powerful employers asserted their sovereignty over the workplace. But what is important is that these groups of workers did not recognize a stark divide between political and economic democracy — and vigorously sought to exert sovereign control in the workplace. While political democracy continued to evolve into the Progressive era, workplace relations remained in a quasi-feudal state, taking for granted the employer’s sovereign control of the workplace. Employers responded with the standard repertoire of repression, to which they added technical, ideological, and organizational tools for reasserting management control. At the technical level, increased mechanization appropriated workers’ knowledge of the production process and undermined their autonomy, while embedding management’s control in the regular, relentless pace of the machines. At the ideological and organizational levels, scientific management and the parallel rise of human resources management sought to supplant the idea of workplace democracy with that of management as a progressive, rational, efficient force that could address workers’ needs while retaining its own control. Many employers added to this a series of employee benefits known as “welfare capitalism,” using material incentives to convince workers to cede workplace sovereignty to management voluntarily. These management tools put a lid on conflict over workplace control after World War I, but the conflict flared up with renewed fervor in the 1930s and 1940s, highlighting three key points related to workplace democracy. First, the core battles of the period were primarily over the question of workplace control — not pay and benefits. From the eruptions of 1934, to the “sit-down fever” of 1936-1937, to the wave of World War II wildcats, workers were calling employers’ sovereign control of the workplace into question. Second, they were able to mount this challenge to employer sovereignty thanks to dense networks of formal and informal shop-floor organization. Third, these networks were held together by a “militant minority,” a layer of politically conscious, trained organizers from various radical Left traditions. Many were Communists, but they also included Trotskyists and other strains of socialists. The struggles of the 1930s and 1940s marked a decisive and contradictory shift in the fight over workplace democracy, establishing the Wagner Act model as a basis for extending certain democratic rights into the workplace. In addition to marking a significant encroachment on employer sovereignty, the Wagner Act and other New Deal reforms sought to expand notions of citizenship. Seeing economic security as essential for full political citizenship, New Deal policy and rhetoric, particularly President Roosevelt’s idea of the “Four Freedoms,” echoed the old labor republican calls to link economic and political democracy. As such, they succeeded in taking “the labor question” off the table. There was now an answer to that question, and it could be summed up in two words: collective bargaining. However, if the New Deal expanded notions of citizenship, it also limited them in crucial ways. In addition to reinforcing existing gender and racial inequalities, as many scholars have noted, the New Deal reoriented conceptions of economic citizenship around guaranteeing an “American standard of living,” a level of material security that would allow (primarily white, male) workers to support their families and participate fully in society. It was a vision of economic citizenship aimed at workers’ lives as family members and consumers, not as workers. While collective bargaining did bring a measure of citizenship into the workplace, what came to be known as “industrial democracy” focused on guaranteeing basic civil rights like freedom of association and due process. Questions of workplace sovereignty and control were cast aside. The separation between workplace civil rights and workplace sovereignty that characterized postwar industrial democracy resulted from three factors. First, employers who chafed at even the Wagner Act’s partial infringement on their sovereignty launched a systematic campaign even before the war was over to “[put] businessmen back in a position of leadership in the national economy” and reassert their “right to manage.” Second, judges and legislators helped employers by “deradicalizing” the Wagner Act via legal rulings and the 1947 Taft-Hartley Act. These took particular aim at the forms of collective action that workers had used to assert workplace sovereignty, including sit-down strikes and solidarity actions. Third, unions undermined their own capacity to assert workplace sovereignty by expelling most of the “militant minorities” of Communists and other radical shop-floor leaders that had been at the forefront of union organizing up to that point. Instead, CIO leaders like Philip Murray and Walter Reuther hoped to build labor’s postwar power and influence by deepening the tripartite forms of political bargaining that the Roosevelt administration had set up. Acutely aware of the need to secure management’s participation in their vision of “Industrial Peace for the Postwar Period,” they proposed a deal: if management would support the Wagner Act collective bargaining framework and commit to a high-wage, high-employment postwar economy, unions would defend “a system of private competitive capitalism,” which specifically included “the inherent right and responsibility of management to direct the operations of an enterprise.” However, they soon realized that such a grand bargain was not on offer. Not only could they not get management to agree to their terms, they could not even get management to agree to participate in a tripartite bargaining structure. With their power and legitimacy restored after the war, management simply reasserted its inherent right to manage. It did not need to negotiate over the issue. With tripartite grand bargains off the table, postwar labor leaders settled for a more restricted form of industrial democracy. The basic terms were set out in the 1950 “Treaty of Detroit,” the five-year contract negotiated between Walter Reuther’s United Automobile Workers (UAW) and General Motors: union recognition and regular wage and benefit increases in exchange for management’s control over production. This was a deal that could promote economic citizenship defined as access to an “American standard of living.” But it rejected a vision of citizenship that included the workplace. That would remain management’s sovereign domain, with certain civil rights spelled out and enforced via a bureaucratic grievance procedure. What rights were not spelled out were reserved to management, as the soon-to-be- ubiquitous “management rights clause” in nearly every union contract would stipulate. This restricted industrial democracy did raise living standards for workers overall in the postwar decades and continues to provide an economic advantage for the small percentage of US workers who are union members today. But the lack of workplace sovereignty or control took its toll, manifesting as a wave of wildcat strikes in the late 1960s and early 1970s. While popular media accounts focused on generational shifts and individual worker alienation— the “blue collar blues”—the real problem was unchecked management authority. Unionized workers may have enjoyed good pay and benefits, but what they really wanted was “to be treated like American workers, human beings, not as pieces of profit-making machinery,” as the bargaining committee at a striking auto plant in Lordstown, Ohio put it in 1972. As dehumanizing as the situation at Lordstown and other unionized factories was in the early 1970s, at least those workers had unions to provide organizational infrastructure for their protest. But as union decline accelerated under President Reagan, the concept of industrial democracy came to appear quaint. With unions losing ground, helplessly watching factories shutter or negotiating over how deep concessions would go, a new discourse on redesigning workplaces for the modern era focused on union-management partnerships and the “team concept.” Management techniques like the Toyota Production System and the broader move toward “lean production” became central to management’s assertion of dominance over the shop floor. Rhetorically, these ideas emphasized workers as agents; after all, entering into a “partnership” or choosing to be on a “team” with management requires an active decision to collaborate by workers. But as critics pointed out at the time, the partnership models quickly proved to be little more than schemes to force workers to set the terms of their own exploitation, covered with a thin sheen of democratic participation. As the new millennium began, and capital continued to rack up wins in what former UAW President Douglas Fraser called a “one-sided class war,” the rhetoric of union-management collaboration and partnership fell silent — scarcely any unions were left to collaborate with. Those that remained had all but abandoned the workplace as a terrain of struggle. The economic effects of that victory are well known: real wages stagnated as productivity climbed, corporate profits constantly broke new records, and economic inequality climbed to its highest level since the Great Depression. But this weakening of worker power also made for a bleak landscape at the workplace level. Unfettered by organized labor, companies could do as they pleased in the workplace, from major decisions about opening and closing work sites to inflicting ever-accumulating, quotidian slights and indignities. Factories continued to be shuttered and moved overseas — or down the road to lower-paid, nonunion plants; white-collar workforces similarly saw mergers and “downsizing.” In all sectors, workers saw whatever grip they had on their workplaces slip away, as management demanded more responsibilities, greater output, and longer hours. In addition, management expanded more granular forms of control on the job. Employers vastly increased the use of noncompete clauses, forcing everyone from factory workers to fast-food sandwich makers to sign agreements limiting workers’ freedom to leave a given workplace and find work in a similar field. One industry estimate suggests that the use of such agreements has tripled since 2000. Employers continued to use technology to control the workplace — and their workers. For example, in West Hollywood, California, Hyatt Hotel housekeeping workers reported being given iPods outfitted with a program in which they had to log the moment they started cleaning a room and the moment they finished. Even keeping workers’ freedom over bodily functions was a losing battle. There was a continuous stream of lawsuits and public conflicts over workers being permitted to use the bathroom, such as the unionized Jim Beam distillery workers in Kentucky in 2002 who sued their employer after they were disciplined for relieving themselves outside of company-approved times, as well as forcing female workers to report the onset of their menstrual cycles. As management control over the workplace consolidated, workplace democracy as an idea evaporated. Business discussions of “industrial democracy” in the postwar period, and “the team concept” in the 1980s, at least paid lip service to worker participation. Today’s popular business books take management’s control of the workplace as a given; workers should expect to do the work of two or three employees, or be downsized or forced to switch careers every few years — and be grateful for the new opportunities it produces. Although organized labor has not been completely vanquished, its campaigns have not focused on democracy or control of the shop floor. Living-wage campaigns have won some major pay raises for nonunion workers in cities like Baltimore, but have left control of the shop floor largely untouched. Likewise, the Fight for $15 campaign has not only set a bold standard for the minimum pay workers deserve, but won tangible victories establishing a $15 hourly wage floor in cities like Seattle. Still, control of the workplace — particularly despotic in the fast-food industry — has mostly been off the table. Labor scholar and strategist Jane McAlevey argues that “New Labor,” the progressive wing of the labor movement clustered around the SEIU and other reform-minded unions, has shifted away from workplace fights to focus on tactics like “corporate campaigns,” which leverage strategic research to pressure corporations, but leave little role for workers. This shift has furthered unions’ all-but-total disinterest in challenging management’s sovereign control of the workplace. Even in labor’s progressive wing, the question of democracy at work has been ceded. But not all unions have given up on the labor question. Some teachers, unions, such as those in Chicago and Washington State, have made resisting what Shawn Gude has called “the industrial classroom” central to their organizing. This includes battles over large class sizes, the overuse of standardized testing, excessive paperwork, and teacher evaluations pegged to student performance. Washington teachers engaged in a series of one-day strikes in 2015 to demand reduced class sizes alongside hikes in compensation, and backed a binding ballot initiative to significantly reduce class sizes that eventually passed. Nurses unions won a hard-fought battle in California in 2004 to establish a maximum nurse-to- patient ratio in the state’s hospitals and have zealously defended the law — the only one of its kind in the nation — from health care companies looking to chip away at it. The law provides the basis for a modicum of control on the hospital floor, allowing nurses to tend to fewer patients in a given shift. And the Fight for $15 has recently prioritized bringing an end to on-call scheduling practices — in which workers are kept in the dark about their work schedule until sometimes hours before a shift begins, making impossible the planning and living of a normal life. While most workers continue to check their democratic rights at the door of the warehouse, school, and hospital every day, these examples suggest a hunger among workers for organizing around issues of workplace democracy — and point the way to developing a new model for exercising political and economic citizenship. A century ago, many recognized that problems of low pay, long or irregular hours, arbitrary treatment, and other issues arising from unchecked employer sovereignty impeded workers’ ability to exercise their full citizenship rights, posing a challenge for democracy. Today, with economic inequality and management’s control of the workplace at levels not seen since that Gilded Age, the labor question has renewed relevance. The postwar Wagner Act model of industrial democracy was always an incomplete answer to the labor question. But the employer offensive of the past three decades has left that model in tatters. Finding an answer to today’s labor question involves figuring out a new model for exercising political and economic citizenship. Such a model requires three components: civil rights, including due process and freedom of speech and assembly, particularly the right to strike; economic security, including decent wages and benefits; and a degree of workplace sovereignty. Updated forms of collective bargaining and government regulations can go a long way toward promoting the first two. The third is more challenging, because it requires a more direct confrontation with employers’ power. History suggests that employers can tolerate having to pay more in wages and benefits, or even having to provide certain basic procedural rights. But challenges to their workplace sovereignty are a bridge too far. Even at times of mass worker upsurge like the 1930s and 1940s, employers clung tenaciously to their “right to manage.” At a moment when they are reticent even to grant concessions on wages and benefits, a fight for greater workplace control will be daunting. Compounding the problem of challenging employers’ sovereignty in the workplace is the problem of defining the modern workplace and identifying the employer. Fragmented forms of work organization and byzantine corporate-ownership structures mean that the location of employers’ power may be far removed from where workers are working, both physically and legally. Establishing a clear understanding of who exactly is accountable for workplace conditions is essential to giving workers an opportunity to seek redress for everything from low pay to workplace despotism. When an Uber driver’s app is deactivated by the company, or a temp agency refuses to renew a worker’s contract, workers have little recourse: there is no boss to confront. If these workers are to exercise any level of democratic control of their work, they must be able to confront their boss as a boss. To do so, the boss must be brought out from behind the veils of subcontracting and independent contracting that currently obfuscate what are fundamentally management–worker relationships. Strategic research is crucial for untangling structures of corporate ownership and control, and exposing management’s game of “hide the boss.” The core challenge is to find ways to translate the leverage that strategic research creates outside the workplace into power exerted at the workplace. That requires bringing workers themselves back into the picture. Voluntary agreements and government regulations can start shifting the balance of power at work, but without a mechanism for day-to-day enforcement, they will fall short. The specific forms this new workplace organization may take are yet to be determined, but previous efforts at expanding worker sovereignty underline the importance of “militant minorities” in the workplace. Such currents within labor exist today and could expand in the future. While currently not at the scale needed, some cross-union efforts suggest the kinds of tools that could help rebuild this critical workplace infrastructure. The Labor Notes project, for example, holds local and national conferences and distributes magazines, books, and online resources focused on building that militant minority. Such programs connect workers and reform-focused union locals across different cities, states, and countries, with a focus on practical organizing skills. These networks could play key roles in future efforts at organizing, articulating, and enforcing new conceptions of workplace democracy. They could train and mobilize shop-floor activists who could not only serve in day-to-day battles over shop-floor grievances and contract campaigns, but in agitating their coworkers specifically around the lack of full citizenship rights on the job. 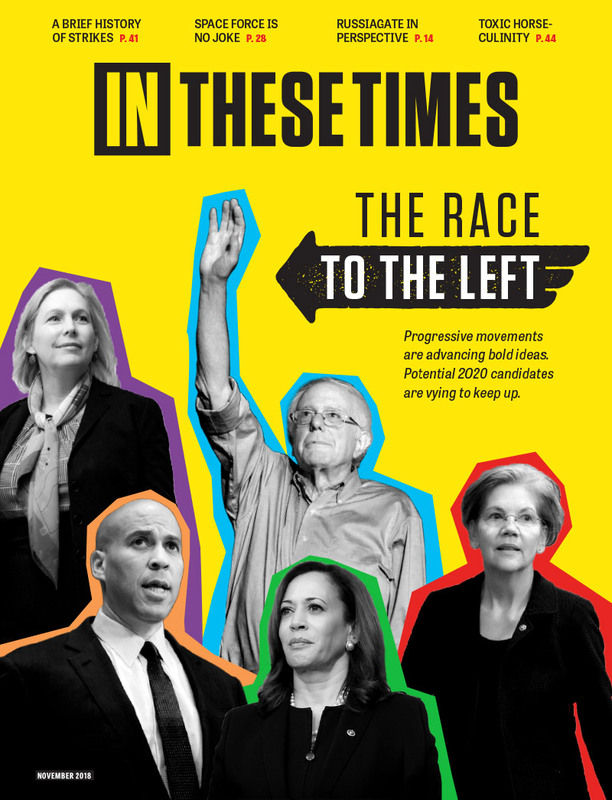 In addition, even though today’s left pales in comparison with the left that built the militant minority currents of the 1930s and 1940s, radical politics are again catching on. The Democratic Socialists of America, for example, has seen an explosion in membership in the past year and a half, growing from eight thousand members before Bernie Sanders’s presidential campaign to thirty thousand today. If even a portion of that membership dedicated itself to rank-and-file struggle, as Communist, Trotskyist, and other leftist groups did in the past, and connected the struggle for democracy at work to their conceptions of a just and democratic world, the labor question could again be central to contemporary worker struggles. Democracy on the job is not merely a niche issue primarily of interest to clueless intellectuals, nor is it a nice “add-on” that must take a back seat to more pressing issues. It is an essential part of any strategy for rebuilding working-class power. Although they may not yet articulate it as such, workers experience the stark gap between democratic citizenship rights in the broader society and rights on the job every time they are subject to arbitrary procedural changes on the job that they have no say in, or when a boss refuses to let them use the bathroom. Many union organizers today note that even in low-wage workplaces, the issue that most moves workers to action is not low wages — it is lack of respect at work. That lack of respect is intimately tied to a sense of powerless on the job. Organizers and rank-and-file activists can help their coworkers connect the dots between these daily petty indignities and the broader regime of despotism they toil under, and articulate a compelling alternative vision of democratically run workplaces. Such a vision could begin to provide an answer to a labor question that remains as important as ever, even though it has faded from view. At a moment when the idea of democracy writ large is under attack from demagogues and technocrats alike, a renewed push to expand democracy and citizenship into the workplace could offer a galvanizing framework for reaffirming the fundamental idea that the people should rule. Barry Eidlin is an assistant professor of sociology at McGill University and a former head steward for UAW Local 2865. Micah Uetricht is an associate editor at Jacobin. He is the author of Strike for America: Chicago Teachers Against Austerity and a graduate student in sociology at McGill University.